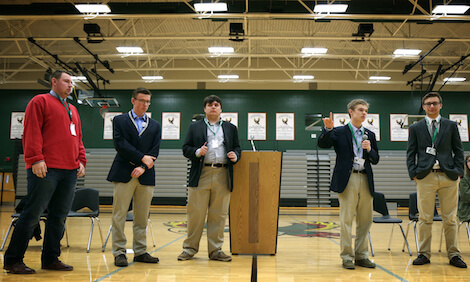 Several of the teenage candidates running for governor of Kansas debated important issues at a forum held at Free State High School in Lawrence, Kansas. There are six teenagers in Kansas who are doing something that most high schoolers have never done. They are running for governor! Kansas has no rules about how old a candidate for statewide office has to be. However, now that these teenagers are running for governor, there are calls for setting a minimum age to run for office. But the new law will not affect this year’s election. Tyler Ruzich, Ethan Randleas, Joseph Tutera, Jr., and Dominic Scavuzzo are running as Republicans. Jack Bergeson is running as a Democrat, and Aaron Coleman is running as an Independent. The primary elections for the Republicans and Democrats will be held in August this year. During the primary elections, the two main parties will pick the candidate who will represent the party in the general election. The general election will be in November 2018. In addition to the six teenage candidates for governor, another teenager, Lucy Steyer, is running for Secretary of State. She is 17 years old and is running as a Democrat. She is currently one of the only female candidates for statewide office in the state. The students say that they want to express their views on the issues, from funding for schools to corporate tax rates. They hope to get as many people involved in politics as possible. In spite of having a wide range of views on many of the issues, the young candidates keep being grouped together by their age. They have not had as much contact with their older rivals with the same political affiliations. While Bergeson will be allowed to participate in the Democratic Party’s debates, the Republican candidates will not be allowed to participate in debates held by their party. The Republican Party in Kansas has a rule that in order to take part in this year’s debates, a candidate had to vote in the 2014 election. Since none of the teenagers were old enough to vote then, they are all disqualified from the debates. The teen candidates have held forums where they have debated issues amongst themselves. Some observers think there is little chance for these young candidates to win against their more well-known and better-funded older opponents. Ruzich and Bergeson both said that, for them, getting people to talk about the issues important to them and getting their peers interested in politics would be a kind of winning as well. How many teenagers are running for governor in Kansas? Which teenager running for Kansas governor is running as a Democrat? Click to read about this month's important days.